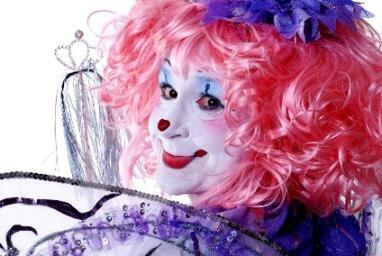 If you are going to dress like a clown, then clown makeup is an important ingredient to a successful costume. Whether for Halloween, a theatrical performance or a child's birthday party, clowns are instantly humorous and entertaining. Before you can begin the steps toward applying any type of clown makeup, you will first need to decide which type of clown you hope to be. Although you will find many variations, all clowns essentially boil down to these four types. As auguste translates to foolish in German, this is the classic bumbling goofy clown common in the circus. You will see them as clumsy fools who are always knocking each other over and slipping on banana peels. These clowns require the most exaggerated of the costumes and clown makeup. Your clown outfit will be complete if you also have a red rubber nose and baggy pants. These types of clowns are actually dressed like other characters, basically silly versions of either common people or things. The most widespread example is the tramp or hobo character clown. Originating in the first half of the 1900s, hobo clowns would dress in rags and carry the classic bag on a stick. Completed by the exaggerated black unshaven face and white mouth, this clown tends to play the role of the victim. Typically the sophisticated clown costume with fine silk ruffles and simple designs, the pierrot clown is the elegant variety. Movements and actions are mimed in silence and the clown makeup is characterized by a full white face with features and colors small and delicate. The mélange of clown costumes is the whiteface clown. The most common form of clown seen today, it mixes many of the looks and actions of the other clown types. Before you can actually begin the art of clown makeup application, you must accomplish the following steps. Purchase the clown makeup. You basically have two types to choose from: professional theatrical greasepaint or basic face paint. The greasepaint is utilized by professional clowns as it provides the most drama and lasts the longest. Unfortunately, it is tricky to work with and can be hard to find. 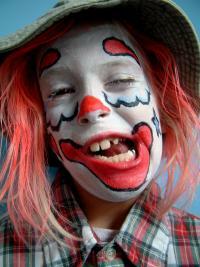 Basic face paint is recommended for homemade clowns and can be bought from toy, craft or Halloween stores. Scrutinize your face in the mirror. By looking closely at your face, you can determine which features you want to embellish as a clown. Also practice different expressions and see how your face changes. These looks can be enhanced to create your own distinctive clown face. Practice drawing your clown face on paper or your computer. Try out a few looks using colored markers with a face drawn on paper. Better yet, if you are technology savvy, use a digital image of yourself and draw a clown face with your computer paint program. Whichever method you select, just make sure you have it right on paper first. Lastly, do at least one dress rehearsal on your face. Although it may seem easy at first thought, face paint can be actually quite difficult to apply. The face is full of features, which makes it a rather distorted canvas to work with. A few trail runs before your big clown adventure will save you time and headaches on the actual opening night. Place your clown costume on first before you apply the clown makeup, and then simply cover it with an old towel or cloth. Always pull hair back off the face with either a hair band or shower cap, you can then add a wig or redo your hair after the makeup is done. Clean and dry face completely. Pull back all hair around your face. Apply the overall face color first and start with a thin layer. Let dry and repeat until the intensity of the color desired is reached. Cover all your features with the overall color and then redraw the ones you want to keep. Draw the face you want to paint with an eyeliner pencil. Fill in with the lighter colors first and then add the darker colors. Let the paint dry between each color. Dust the finished look with face powder to set and prevent smearing. Draw new eyebrows in different locations and shapes with eyeliner or face paint. Keep the area between your nose and mouth your chosen face color to accentuate the mouth. Attach a red ball nose or simply draw a red circle on the tip of your nose. Auguste clowns typically leave the face its natural color and accent certain features with paint. Pierrot clowns have a completely white face with minute features, like a small rosebud mouth and red dot for the nose. Also add a teardrop or star on your cheek.